The long-awaited 3D animations are here. Remember how Paint 3D brought Paint into a new dimension, with stamped textures and 3D objects? 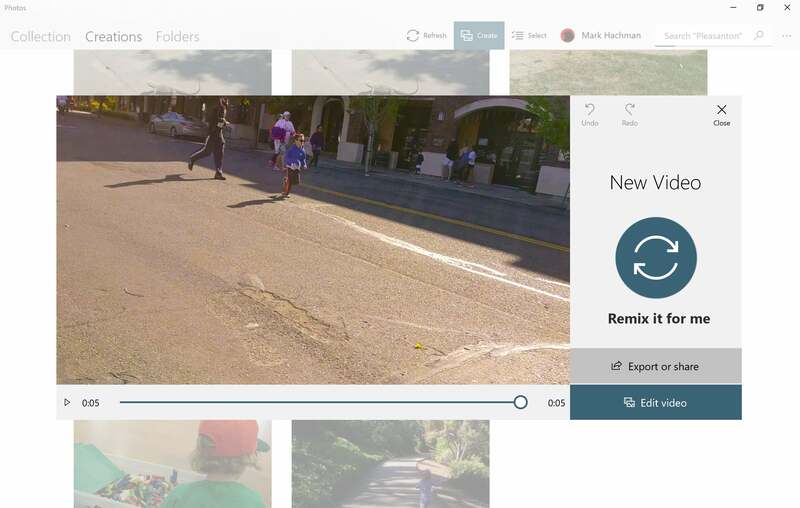 Story Remix adds the same creative element to Windows 10’s Photos app. Unfortunately, it’s not quite the cohesive experience you might hope for, as Photos now has two different interfaces—the traditional app and Story Remix—and you may need to bounce back and forth between the two. The new Story Remix interface, found within the Photos app. How do you know if you have access to Story Remix? The tipoff is the new tab names at the top of the app: Collection, Creations, and Folders, which replace the older Collections, Albums, Folders hierarchy. “Collection” is where your camera roll of photos are stored, and “Creations” is where your new slideshows and video projects will live. 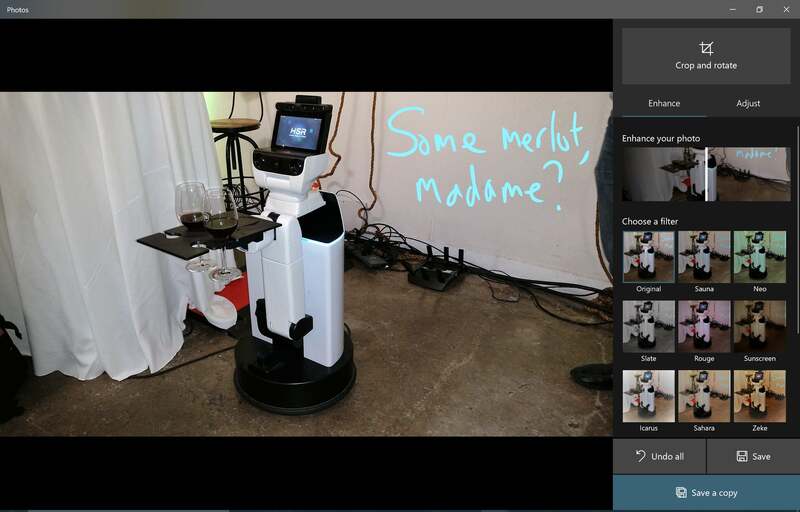 The more traditional “Photos” interface, which supports inking and automatic image enhancing, among other adjustments. Story Remix does neither, at the moment. It’s worth noting, though, that Story Remix and Photos coexist (for now) within a sort of odd, yin-yang duality. If you choose to open or edit a file within Photos via File Explorer, Windows will open the “traditional” Photos interface. 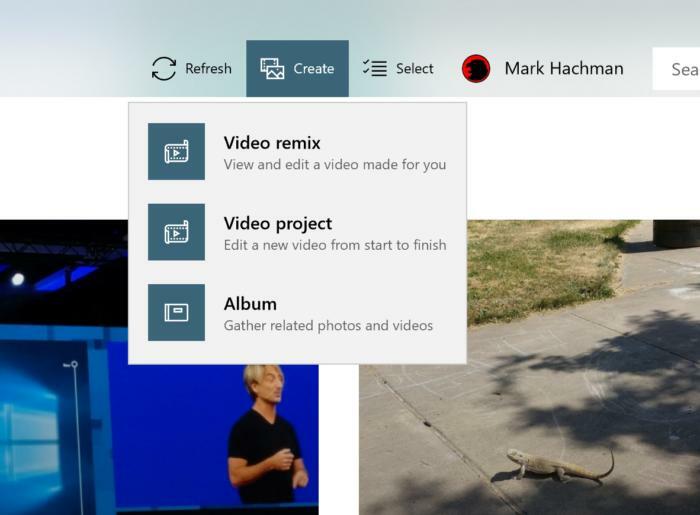 But if you simply launch the Photos app, the Story Remix interface will open. Interestingly, there also seems to be no way to transition between the two interfaces within the app itself. For the purposes of this evaluation, though, we’ll concentrate almost exclusively on Story Remix. I really love the search feature, which automatically pulls out faces of people that appear in your photos, even kids without a Microsoft account. Once you launch Photos (Story Remix), don’t jump past the search box—this is one of its better features. Once Story Remix is enabled, Photos will slowly index (about one image per second, according to a progress bar on my machine) each of the photos stored on your PC and OneDrive. The search bar allows you to search by location and topic using Microsoft’s own machine learning—when I searched for “snow,” for example, it pulled up pictures of a recent ski trip. Side note: I back up my photos to both Google Photos and OneDrive, and both services are somewhat equally matched. Google found many more “snow” photos, but Microsoft unearthed more “beach” photos. Where Google excels, though, is its ability to search by face, and even name those faces. It makes it immeasurably easier to hunt down photos of your sister Christina. 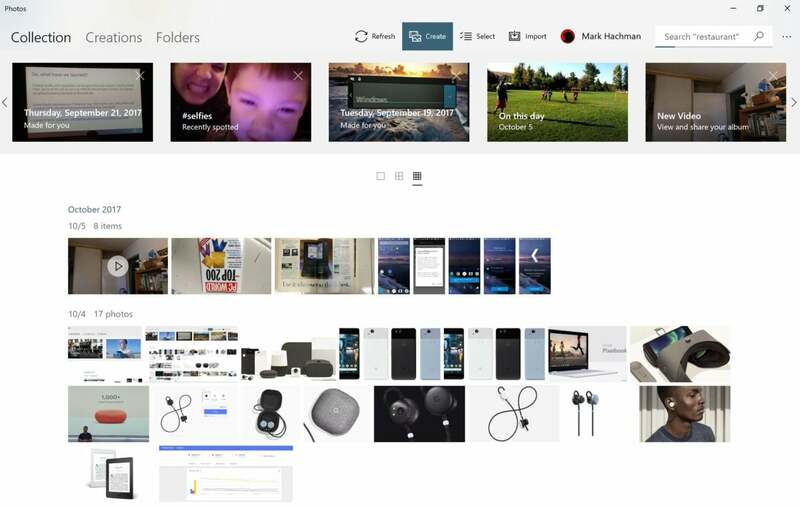 Microsoft also offers this feature—just click on the blank search box—but it pulled up far fewer pictures than Google. In the current Windows 10 Creators Update, you may notice Photos occasionally sending you notifications that it has “created a story” for you, based on Photos you took on a certain date. That story was originally just a page of photos. Story Remix goes a step further, with “Made for You” collections at the top of your Collection page. Inside you’ll find an algorithmically created slideshow made of photos Story Remix finds interesting, each with a bit of variation: a slight pan across, a bit of motion. This is where Story Remix really kicks off. The options for what to do with video appear under the Story Remix “Create” menu. To get started with Story Remix, click the highlighted Create button at the top of the screen. You’ll be able to select from three options: Video remix, Video Project, and Album. Album is the simplest option. It allows you to pull out whatever photos and video you’d like into a collection. If you open the album, you’ll see the same dynamic slideshow that the “Made for You” creations display, with a bit of motion tying them together. You can save it as a video project. 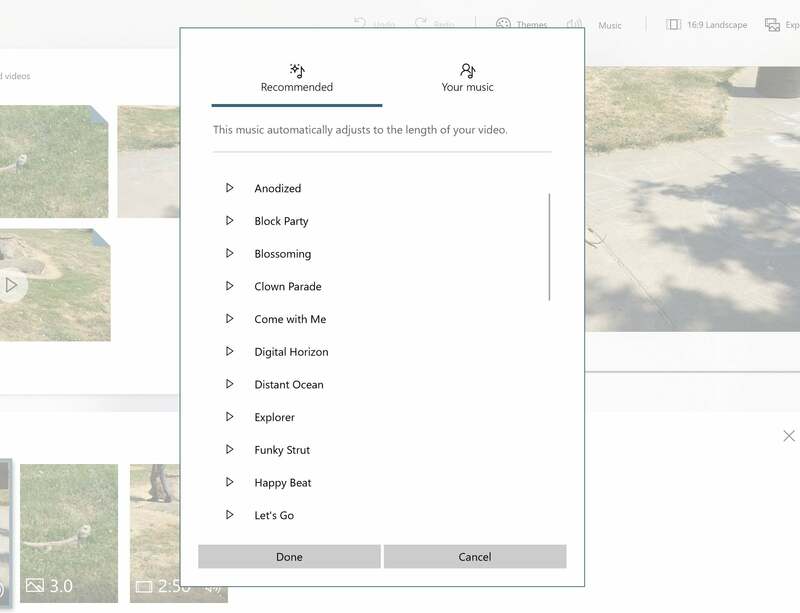 Video Remix allows you to select the photos and images you’d like inside your video, then lets Microsoft do the work for you. If it doesn’t quite turn out, you can “Remix” it and Windows will try again. Like Albums, the Video Remix option allows you to select a group of photos and/or videos. Then Microsoft’s algorithms go to work, trimming them down to their essentials, and adding music. Note: While Albums save as “albums” in your Collection, Microsoft seems to use “Video” and “Story” somewhat interchangeably within Creations. All of the various terminology is unnecessarily confusing. I found “Video Remix” to be just plain lousy. It took a few minute-long videos and edited them down to composites of just about six seconds. If you don’t like the way it turned out, though, you can click the Remix button and Microsoft will automatically redo the whole thing. Fortunately, there’s also the Video Project portion of Photos, which allows you to take total control, from start to finish. In it lies the real reasons for using the Story Remix portion of Photos, anyway: the fun stuff. Once you’ve settled upon your choices, Photos opens an editing screen. 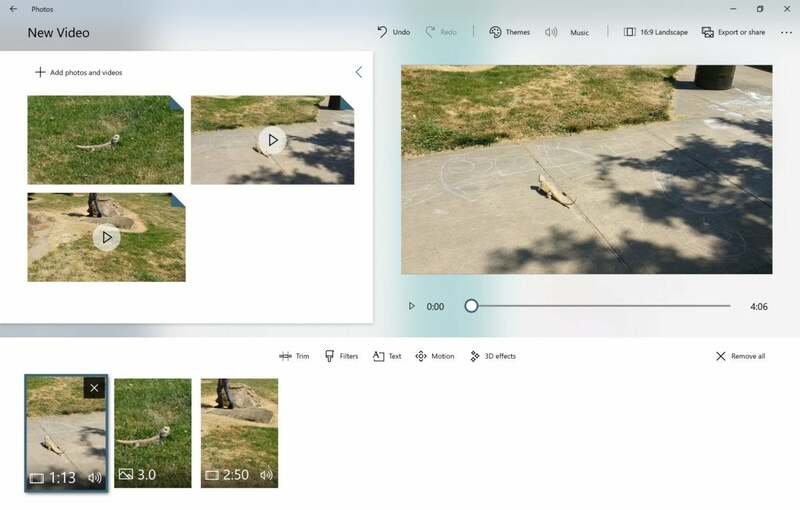 All of your videos and photos are collected in the upper left, with a preview screen for your slideshow video to the upper right. Underneath, on the bottom, is where you’ll organize each segment within the timeline. Here, you can place each photo or video however you’d like, so that one transitions into the next. Slightly above the timeline, you’ll see even more options. You can lengthen the time a photo appears onscreen, apply an image filter, or add text, dynamic panning, and those 3D objects. Oddly, the one thing you can’t do is ink within Story Remix, like you can within Photos. Remember that odd duality we referred to earlier? To write with e-ink on a video, you’ll need to ink it within the standard Photos app, save it, then open it within Photos (Story Remix). It’s an odd twist that makes little sense. Don’t be confused by the numbers attached to each photo or video—they’re not the file size, but the number of seconds each photo appears on the screen. Why is a photo on screen for exactly 3.43 seconds? Because of the Story Remix beat matching. Story Remix allows you to select from either your own (licensed) music files, or else one of Microsoft’s pre-loaded tracks. Because you just can’t tell a proper story without music, each slideshow Story is usually accompanied by music, supplied either by Microsoft or from a file in your Music folder. Photo transitions happen on the beat, to give them a bit more pop. The music will also adapt itself, looping to fill the time available. One of the most exhilarating moments during Microsoft’s Build keynote was when the presenter attached a virtual fireball to a soccer ball that a player kicked into the net. That fantastic capability is finally here, though a bit more limited than what Microsoft originally demonstrated. 3D objects can be added into any video segment—any true video segment, that is. Ignore Microsoft’s confusing terminology, where “video” also refers to the composite slideshow. Here, we’re referring to a few seconds or minutes of actual video, shot with your phone or camera. Once you decide to add 3D objects, a separate editing pane opens. Note that you can “anchor” an effect to a point that remains consistent throughout the scene. Clicking the 3D effects segment opens up a second screen, where you can start adding objects to your scene. 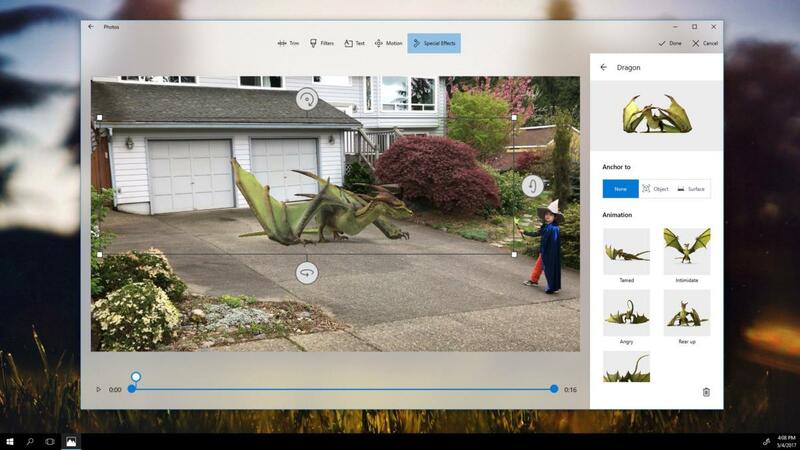 If this seems somewhat reminiscent of another Windows 10 app, Paint 3D, you’re right. Just like in Paint 3D, these effects can be rotated around multiple axes, enlarged, and set to persist over a prolonged period of time. Multiple 3D effects can be in play at once. They can even be anchored to a point in space, so as the video moves, the effect will remain. 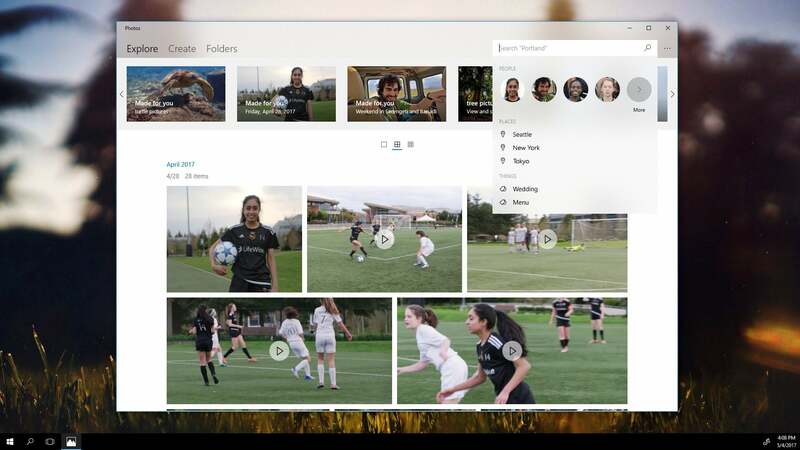 That’s not what Microsoft showed at Build, where Microsoft showed off effects anchored to objects within the video, such as the soccer ball, as well as surfaces. Nevertheless, Microsoft representatives assured us that the functionality remains. If you attach an effect to an object like a soccer ball, any effects should remain fixed to it as it moves about the screen, we’re told. As they say, your mileage may vary. Some of the 3D effects available within Story Remix and Photos. 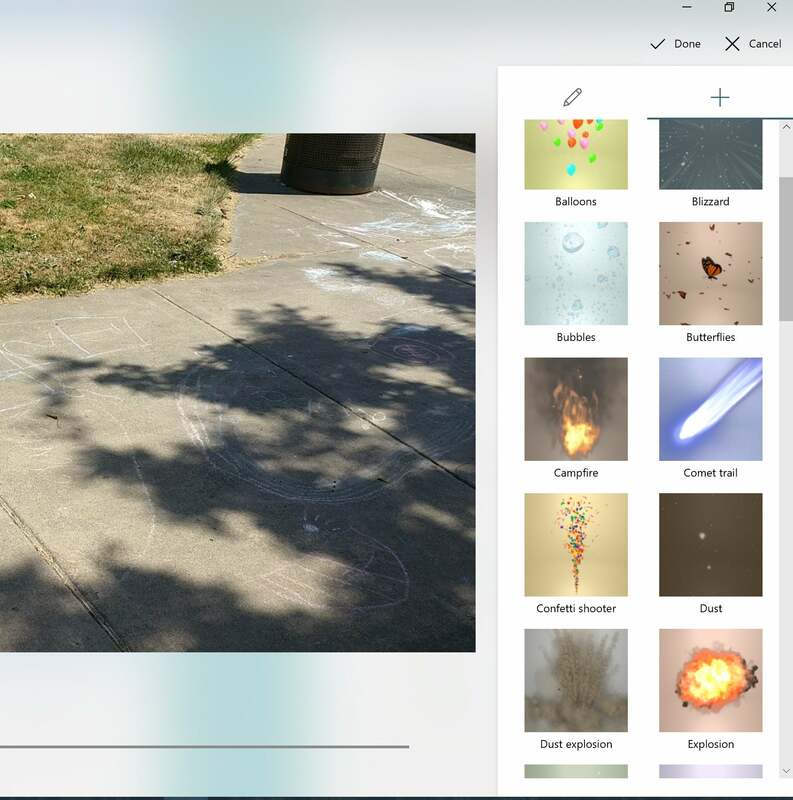 Microsoft offers 42 effects to begin (including laser lights, explosions, falling leaves, and tornadoes) with the promise that more will be added later. 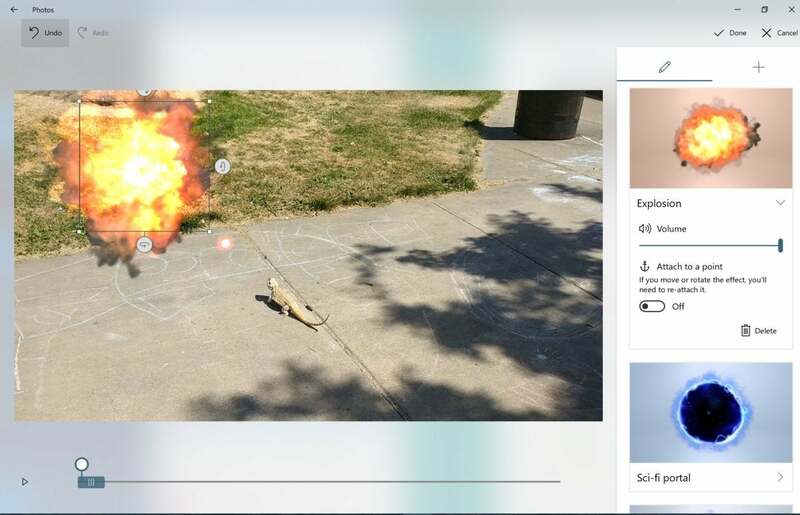 It seems likely that the 3D effects Microsoft already designed for its HoloLens app, called ActionGrams, will eventually make their way into the Story Remix update to Photos. Still, the animated dragons and wizards with which Microsoft introduced Story Remix to us have yet to arrive. And we’re also seeing reports that some effects will be held back for Office 365 subscribers—let’s hope those aren’t true. Naturally, your slideshow can be shared. Due to their complexity. however, you may find that you’ll be sharing a link to the slideshow on OneDrive, rather than the actual file. You’ll also have the option to share them at three different levels of resolution, to minimize file sizes. 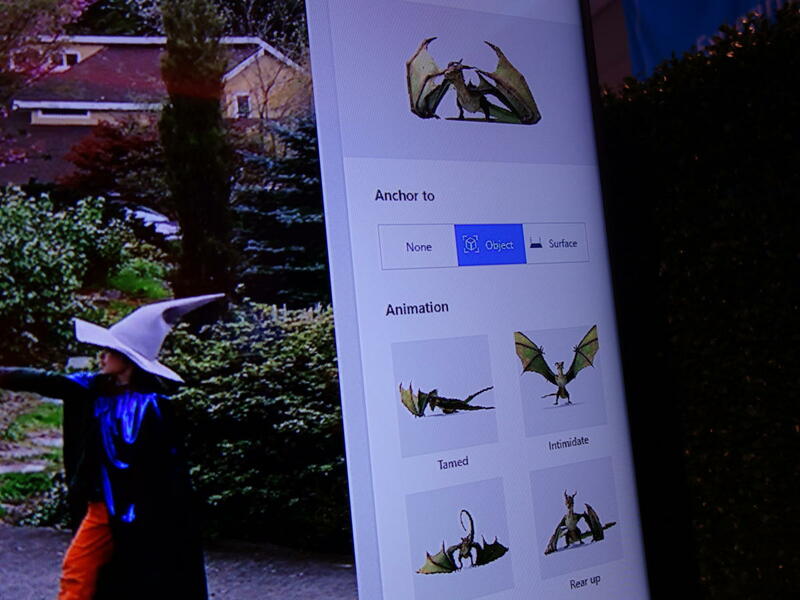 Microsoft’s demonstration from earlier this year shows dragons and other mystical beasts in various poses, locked to an object or surface. That’s not here yet, but could be added in the future. It’s great to see Microsoft delivering on a feature it promised for the Fall Creators Update from the very beginning. More importantly, Story Remix injects a note of the creativity that the term “Fall Creators Update” implicitly promises. In all, Story Remix deserves a bit more polish. But Microsoft has once again opened the door into creative expression within Windows. Hopefully it finds an audience.